My 12 year old daughter, Rachel, jumped up and down as if on a pogo stick in her excitement. Of course, I figured it was just pre-teen dramatics. It had been pretty windy outside. I imagined a large branch on the car. “Was it a branch that fell on the car?” I said coolly. I ran to the dining room window. 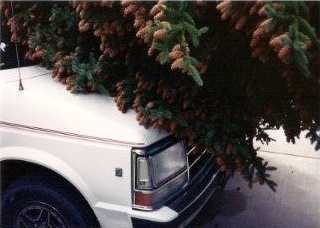 There was a 75 foot pine tree on my minivan. I stared in disbelief. How on earth had that happened? I called my then husband, who immediately called our auto insurance company. 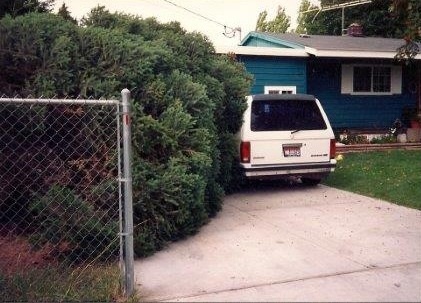 The auto insurance company wouldn’t cover the incident because the car had been parked in the driveway. This was a home insurance issue, they said. Of course, our home insurance had a $1000 deductible. He then called someone to take care of the tree. A man came out with a chain saw and began removing branches and tearing into the trunk. 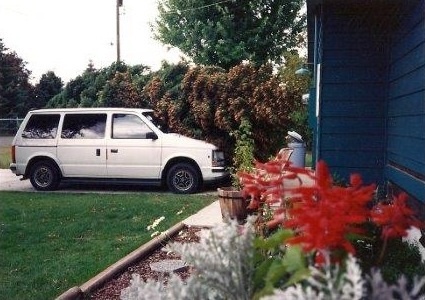 When I got home earlier that day from grocery shopping, I remember pausing to roll the driver’s window up. We had been experiencing strong winds, but it was quite warm outside, so I decided to leave the window down. We found that a very large branch had gone through the driver’s side window. Had I rolled it up, the large branch would have shattered the window. Between the tree and the car, we found the metal basketball hoop pole bent at a 45 degree angle, directly above the car. The basketball hoop partially suspended the tree trunk over the car, keeping it from smashing it. The top of the tree landed on the front hood. 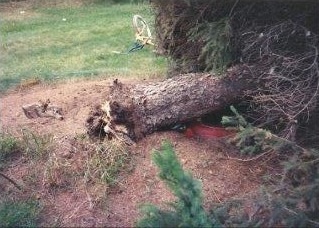 It weighed it down so much, the car rose a few inches once the tree had been removed. Only the windshield had been slightly damaged. The prior six inch crack on the windshield had now been extended across to the other side of the windshield. There were smudges of sap on the hood of the car. That was it along with minor scratches! It was a miracle. Rachel had been playing in the front yard with her rabbit. The rabbit had just run under the car. Rachel was about to get her rabbit when the giant gush of wind knocked the tree onto the car. That was the real miracle! We had two miracles that day. We later found a very frightened rabbit hiding under a bush. I love to hear other’s experiences with God. Isn’t it fun to find Him in everyday living? He’s so good. I find it so inspiring when I read of those kinds of experiencse. God is amazing. He is there everyday, but we often shut him out in our business. Thank you for pointing that out, God wants to be an everyday experience for each of us. Wow – very good! Not good that it fell, but lots of things came in to play to minimize what would happen. 😦 Boo on deductibles! On your avatar of the little sparrow, you can see another bird there. It kind of looks like a swan if the brownish yellow patch on the sparrow’s shoulder was its beak. P.S. I do see the swan when I don’t blow the picture up. Thanks for pointing that out! Great concept! and well executed. It only looks that way when seen in the little avatar frame. The swan has a yellow-white neck/the breast of the sparrow. Swan head is a purplish peach/the head of the sparrow. yellow and orange beak = shoulder of the sparrow. They share the same eye, but the swan is facing towards the right. It’s like one of those optical illusions where it can be both images. I really like it! Oh, the wing of the sparrow doesn’t compose any part of the swan and works as its background. Can you see it? Oh wow! I do see it! It’s so obvious now! I was looking for a tiny swan. Now I can’t help but see it. Thanks for pointing it out, and in my own drawing at that! Great eye George! Well, you know, you just gave me a great gift and so blessed me. I got an epiphany for an excellent metaphor. From my perspective, to God I am just a lowly, common sparrow, but because of His great love, grace and forgiveness through Jesus, He doesn’t see a common or lowly bird. I am reflected in His eyes as a beautiful swan. You made my day! I will be doing a post on this. Is it okay if I use your comments on my post?